NASHVILLE, TN (TSU News Service) — The late father of Tennessee State University President Glenda Glover was honored for his leadership and community service as a civil rights activist. 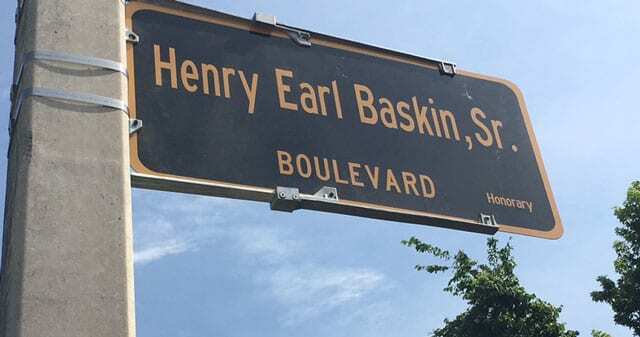 An unveiling ceremony in Memphis, Tennessee, took place on Saturday, June 17, to name a portion of Weaver Road after Henry Earl Baskin, Sr. The Memphis City Council earlier this year approved the street naming resolution that was sponsored by Councilman Edmund Ford, Jr. and Councilwoman Patrice J. Robinson. President Glover added that she and her siblings remember the family patriarch working tirelessly for the City of Memphis, putting all six of his children through college. Four of his children attended Tennessee State University. As an inspirational leader, he made it a priority to assist other students in obtaining financial aid so that they could attend college. Mr. Baskin, a World War II veteran who obtained the rank of master sergeant, devoted himself to a career of community service that began in 1955 when he organized the Weaver Clowns Baseball Club because of racial discrimination. He was denied the opportunity to compete against another all white team. Undaunted, Mr. Baskin became president of the Levi-West Junction Civic Club, and led many marches against discriminatory practices, and for better city services for blacks in the Weaver Road-West Junction area. Mr. Baskin was also an active member of the NAACP, participating in sit-in demonstrations with prominent civil rights leaders and spearheading the march on downtown Memphis that led to sewage lines and indoor facilities for African-Americans in the Weaver Road-Boxtown area. He also led the march that resulted in better fire and police protection, as well as better roads and streets in the South Memphis area. For five decades, Mr. Baskin also had a voice in Memphis politics. He was a campaign manager, a precinct director, and worked the polls every election to ensure adherence to voters’ rights. Mr. Baskin, who was the first black foreman in the Memphis Sanitation Department, was also a juvenile court probation officer for more than 30 years before retiring from the City of Memphis as a zone supervisor, a position he held for 29 years.